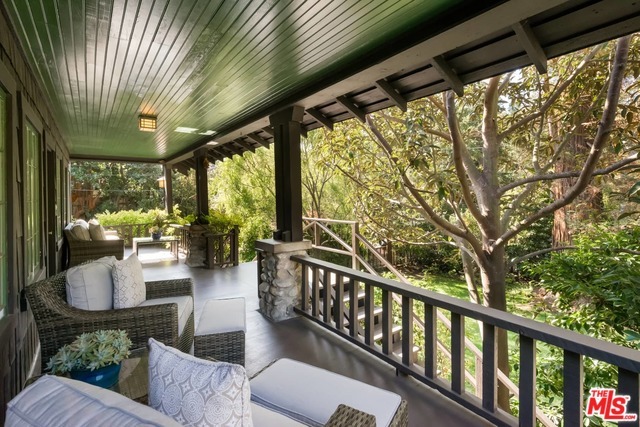 Ted Danson and Mary Steenburgen increased their already substantial residential property portfolio with the $5.15 million purchase of a picturesque micro-compound next door to another mini-compound they already own in L.A.’s rustically ritzy Santa Monica Canyon. Nestled in the shade of a 100-plus-year-old redwood tree amid a colorful garden of begonias and fuchsias, the shingle-clad 1922 Craftsman-style main house has three bedrooms and 3.5 bathrooms in almost 3,900-square-feet. A deep and inviting raised front porch leads to a comfortably capacious, cabin-like combination living/dining room with hardwood floors, a vaulted exposed wood ceiling and a river rock fireplace. There’s also a separate kitchen, a tile-floored family room and a walk-in wine cellar. A more contemporary, two-story guest apartment with its own entrance includes an airy living/dining room with vaulted ceiling and raised hearth fireplace as well as an open-plan kitchen, a separate den/office with built-in desk space and a lofted bedroom with en suite bathroom. Danson and Steenburgen acquired the neighboring property, a since extensively remodeled compound composed of a three-bedroom 1920s wood-shingled Craftsman-style main residence and a two-story poolside guesthouse plus two more guest studios, in the spring of 2014 for $3.47 million and the showbiz power couple — he currently co-stars on “The Good Place,” she on “The Last Man on Earth” and both regularly popped up on the cult classic sitcom “Curb Your Enthusiasm” — additionally maintain a charming brick cottage just outside of downtown Nashville, Tenn., they acquired in 2012 for $750,000, a nearly ten-acre spread in Ojai, Calif., they snatched up in 2005 for $4.5 million and a multi-residence spread on two parcels that total six acres near Chilmark, Mass., on Martha’s Vineyard.